There is a place where extravagant resorts line the beaches and shine in the sun like gemstones; where elite celebrities rub elbows with everyday people in search of escape; where lively nightlife is fueled by days spent lounging in the sun. That place is Cabo San Lucas, on the Baja California Sur peninsula. The splendid hotels of San Jose Del Cabo shine for a reason—they are beckoning you, like the light of a lighthouse. “Come here and relax,” they say. “Forget all of your troubles.” And when you vacation in San Jose Del Cabo, you most certainly will. 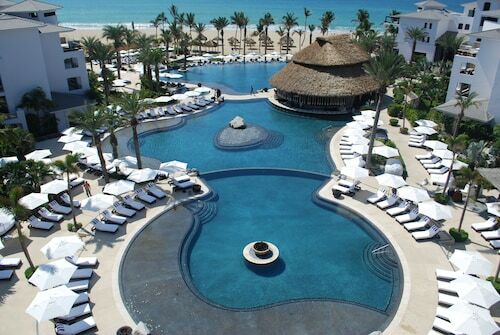 Hyatt Ziva Los Cabos - All Inclusive will impress those who like their resorts luxurious. This 4.5-star hotel is right in the middle of the Zona Hotelera, surrounded by opulent golf courses. Complimentary Wi-Fi and rainfall showerheads in your room are just the beginning. There is a full-service spa, five outdoor pools, and even a water park. Riu Santa Fe All Inclusive is another option for travelers who want all the benefits of an all-inclusive holiday, closer to the action of Cabo San Lucas. You’ll be right on the beach, but with five swimming pools and a nightclub, you may never want to leave the hotel itself. Playa Grande Resort & Grand Spa has a four-star rating, but its location gets five stars from guests. With a private area on Solmar Beach and top attractions and nightlife just a short walk away, you’re all set for a fabulous vacation. Plus, there’s a spa and adult-only pools, for those who aren’t on a family vacation in San Jose Del Cabo. Solmar Resort is in the same neighborhood, and its apartment-style accommodation with kitchenettes will make you feel right at home. With three restaurants, a cafe, and of course, plenty of poolside bars, you’ll never want for anything. You’ll always find one thing in Cabo: Total relaxation. You can have ice-cold pina coladas delivered to you on your chaise lounge for as long as your heart desires, but when you do want to get up, you have options. Journey down to Playa del Amor for spectacular photo ops with your special someone, or take a jaunt on a water taxi out to Land's End, also known as El Arco, for one of the most romantic sunsets you’ll find, anywhere. You can also enjoy Playa Solmar, a secluded stretch of sand with fewer crowds and the stunning surrounds you’ve come to expect, or Playa Medano, a haven for action-lovers with volleyball, jet skiing, and kayaking available. No trip to San Jose Del Cabo is complete without exploring the quaint—and quiet—streets of the Old Town. Begin your journey at the town square, Plaza Mijares, which is positively bursting with traditional charm. Feast on the bounty of the sea before accomplishing all your souvenir shopping in one place…and purchasing some upscale goods for yourself, as well. 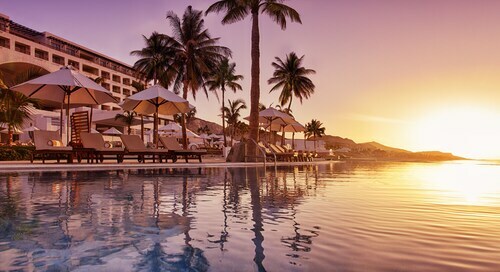 San Jose Del Cabo vacations are always open season for getting much-needed R&R. But you can also coordinate your trip with that perfect event that will give it a little something extra. Winter isn’t just the most popular time for a trip, thanks to all those snow birds fleeing the colder temperatures in the north. It also has the Festival of San Jose from March 8 to 19, with parades, carnivals, and of course, lots of food. Dine on delectable fresh tamales and sugar pumpkin candies in honor of the city’s patron saint. If you prefer to catch your own meal, a visit during the autumn fishing season can fulfill those dreams. In October, you’ll find Los Cabos Billfish Tournament and Bisbee's Black and Blue Marlin Tournament, plus Tuna Jackpot Tournament in November. Go on, take the bait and book vacation packages in San Jose Del Cabo right here on Travelocity. When you bundle your accommodation and airfares in one convenient go, you’ll save both time and money. And once you find yourself sunning on the warm beaches of Cabo, you’ll be glad you did. Nestled on the beach, this San Jose del Cabo property is within a 15-minute walk of Costa Azul Beach and Palmilla Beach. San Jose del Cabo Art District is 2.6 mi (4.1 km) away. Located in San Jose del Cabo, this beachfront property is next to a golf course, 2 mi (3.2 km) from Cabo Real Golf Course, and within 9 mi (15 km) of Palmilla Beach and Los Cabos Convention Center. Chileno Beach and San Jose del Cabo Art District are also within 9 mi (15 km). Located in Zona Hotelera, this hotel is within 3 mi (5 km) of Palmilla Beach, Mission of San Jose, and Puerto Los Cabos. 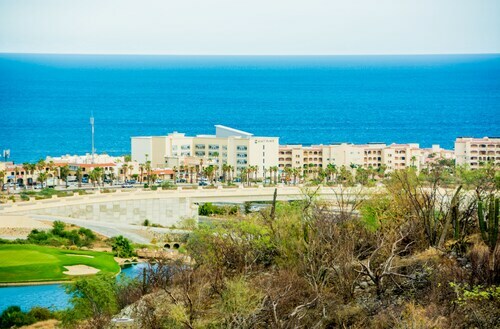 Little Beach and Puerto Los Cabos Golf Club are also within 6 mi (10 km). Located in San Jose del Cabo, this beachfront resort is next to a golf course, 0.1 mi (0.1 km) from Palmilla Beach, and within 6 mi (10 km) of Costa Azul Beach and Puerto Los Cabos. Playa Hotelera and Puerto Los Cabos Marina are also within 6 mi (10 km). Sitting on a stunning beach with amazing views of the Sea of Cortez is Paradisus by Melia Cabos, a newly renovated, luxury all-inclusive resort. Set on 18.5 acres of land and located in Los Cabos, it offers world-class facilities, including the adults-only Royal Service with personalized Butler Service; Family Concierge, a unique vacation experience catering to our younger guests; YHI Spa; and the Life Enriching Experience program.